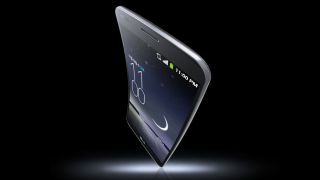 Korean tech giant LG has shared its roadmap for the future, and it's looking pretty exciting, with bendable smartphones due in 2015 and rollable displays set to emerge in 2017. The roadmap focuses on Plastic OLED displays and how they will revolutionise future devices from LG. According to the roadmap, P-OLED displays will be used in 2015 for bendable smartphones, while bendable tablets with P-OLED displays are set to launch some time between 2015 and 2016. That means there's a chance that the LG G4 could be bendable when it arrives next year, though we'd say it's more likely that LG would test the feature in a non-flagship. The bend-less G3 was a brilliant handset, and now might not be the time to shake things up with any crazy new designs. In 2017 LG is planning on bringing the tech to foldable notebooks, rollable tablets and TVs and curved navigation systems for cars. It looks like LG is putting a lot of stock into bendable and flexible technology, and it's already tried its hand at bendable smartphones with the LG G Flex. Whether or not consumers are as enthusiastic about bendable tech as LG isn't clear, but it won't be too long until we find out.